When it comes to cottage gardens... simple and overfilled go together. And those two words don't necessarily usually go together. But cottage gardens are filled with beautiful blooms all mingling together and creating a beautiful spot to delight the senses. Right now we are in the middle of working on adding several new garden areas to our property. 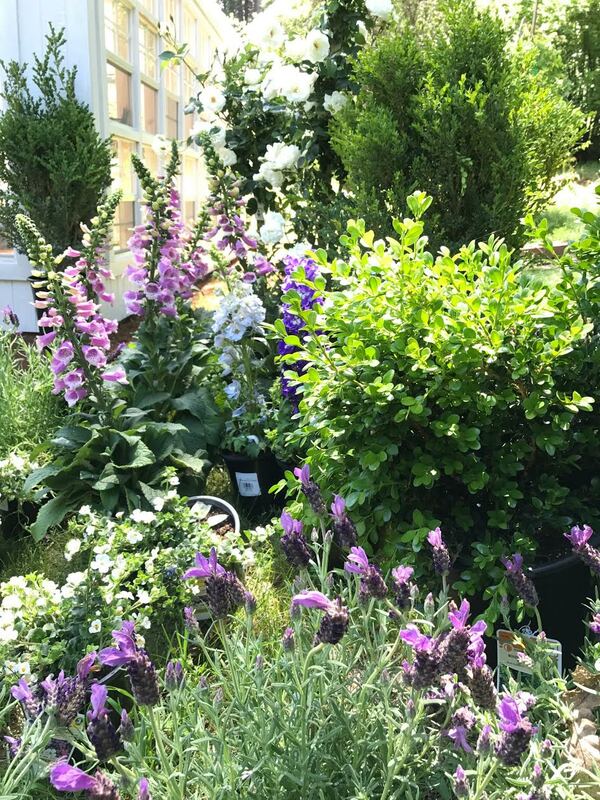 I mentioned before that the cottage garden areas we had in years ago have stopped coming back and so, while we have tons of ivy and green plants that are there and growing well- we have been missing those whimsical cottage blooms. 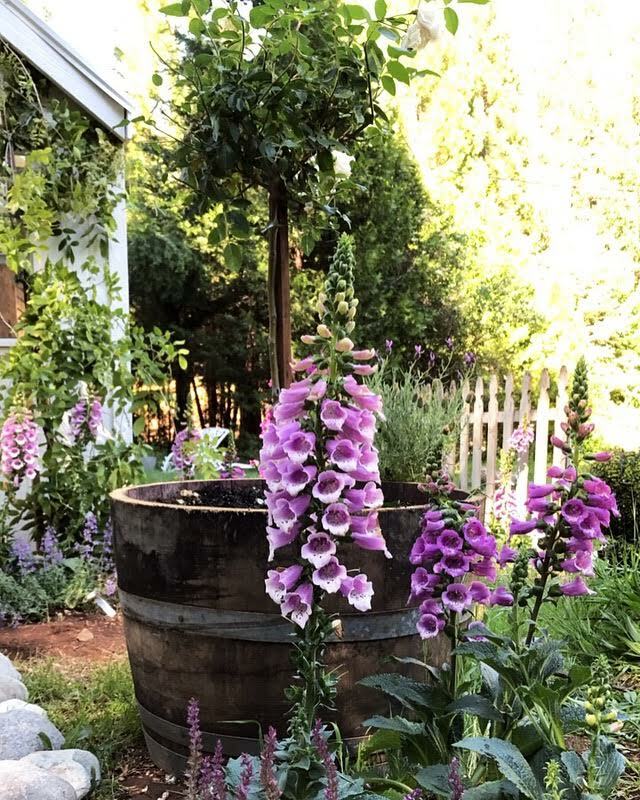 So this spring- with all the rain California has been getting after so many dry years- we decided to get those gardens back blooming. I have a fairly simple color palette that I am focusing on- and that includes white roses. 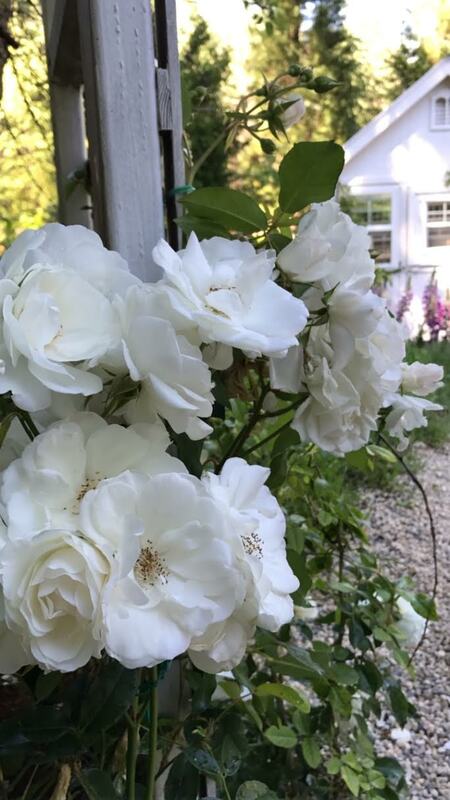 I am huge fan of roses- and white roses in a garden are just incredible. 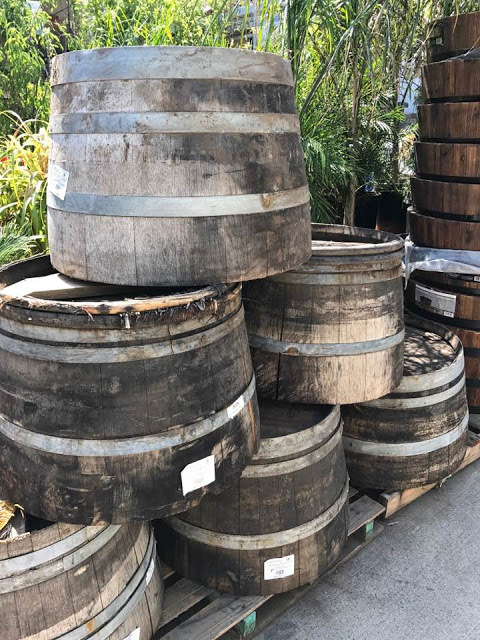 While cottage gardens are filled with lots of pretty faces- I also love to plant a few whiskey or wine barrels with something for some height. I haven't had a chance to plant all of our barrel planters yet... I did get 2 planted with those pretty white roses...and they are waiting for some thyme and bacopa for underneath. But honestly, my grand gardening ideas were squashed a bit this week with that muscle spasm in my neck and shoulder that forced me to chill for a bit. So... I thought instead of sharing some ideas for planting those planters- I would share a tip. One of my rose trees was basically nibbled down to the bare branches. Leaves, blooms, buds- you name it. Yes. Roses are a favorite food for deer. made me a little sad. So, I picked up something that we used to use several years ago when they would make their rounds through the cottage garden beds every day and nibble away... and it works like a charm. In full disclosure- it smells terrible. you won't keep smelling it- but the deer will. even with our deer friends wandering through everyday. and does anyone else have any other tips for keeping your roses blooming beautifully? I would love to know them! Your gardens are so pretty. How long does that smell last? A few hours or days? Thanks! Mostly just a few hours I think. I haven't really noticed it smelling much after that- but I would think if you went over to smell the flowers right away- you might notice it. Alaskan Fishing Fertilizer works great too. Spray on plants and again after it rains. Double duty fertilizes and keeps the deer away. Sounds like another good option for a similar product- thanks for sharing the details! Thanks so much! And goats!? Oh my gosh.. not sure if this spray would work for them lol. Good luck! Your garden is so sweet looking love the colors. 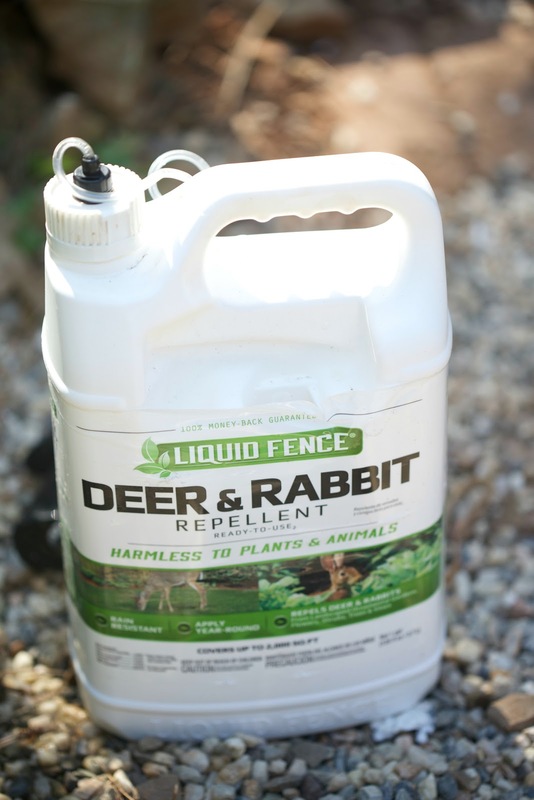 Thanks for the tip about the bunny and deer repel ant. Thank you Pamela! It definitely helps! 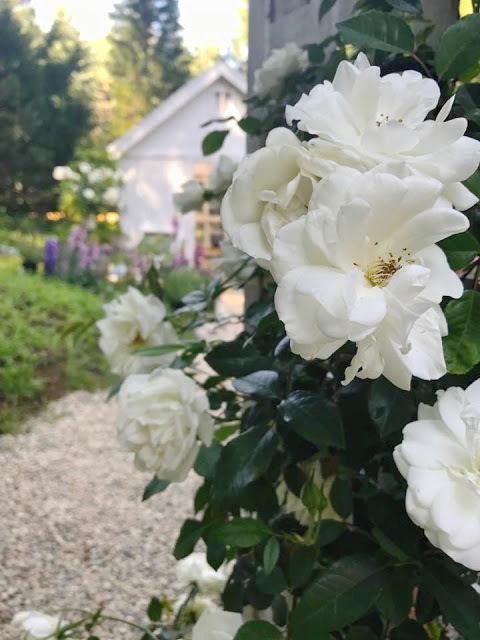 Your gardens are SO beautiful, I love white roses as well. 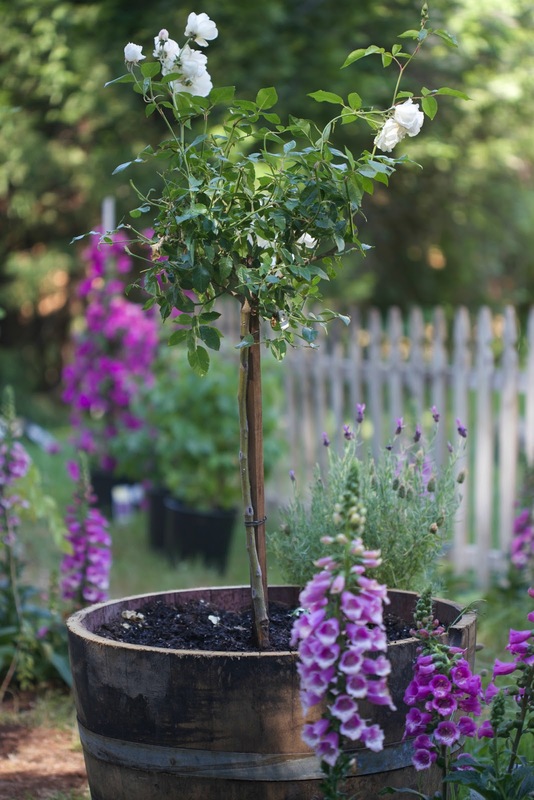 Love the tip about keeping deer away from your blooms! 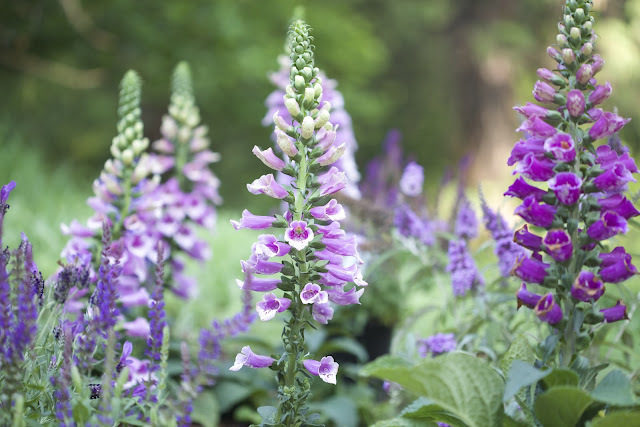 The foxgloves are very lovely with your lavender and roses. They are one of my favorites! I will forward this post to a friend who has been discouraged by the deer that have stormed her rose gardens. She may learn some tips she hasn't tried. I give my roses manure tea two or three times a month, and they have nearly continuous bloom from March/April to December. 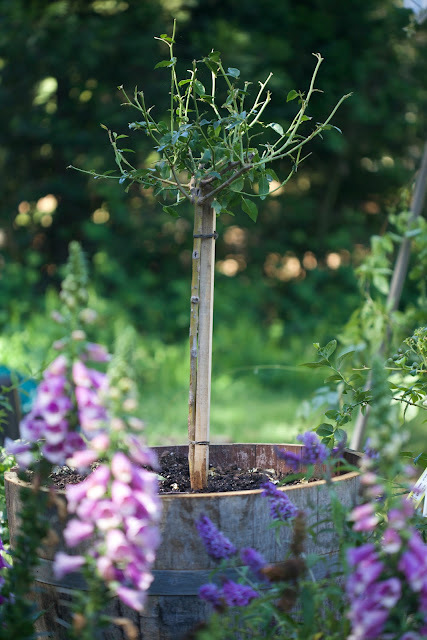 Can't wait to see the fruit of your efforts with your garden projects! Ok a few tips for roses. Start fertilizing in April (I start on the 15th) and once a month after that (around the 15th) until September. Rose Tone is a good all purpose fertilizer. 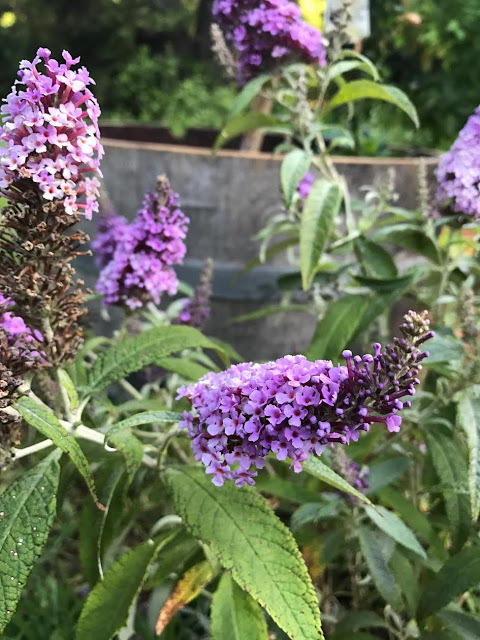 I live in MD so CA may have a longer growing season so you may want to start and end sooner or later. I grow knock out roses so sometimes I do have to spray for black spot. If the beetles come I just cut off all the blooms. Keep the roses trimmed. Bayer three in one is also good for black spot and bugs but not all states carry the product. I had deer come and eat my roses and tomatoes a few years back so I purchased a Scarecrow Motion Activated Animal Repellent. It is a motion water sprinkler and worked like a charm (I did get hit a few times myself so watch out). The roses and tomatoes grew back stronger. Mother natures trimmed for me. Good luck and keep up the great gardening. It is so peaceful place and I like your Photos.. I have a major deer problem. 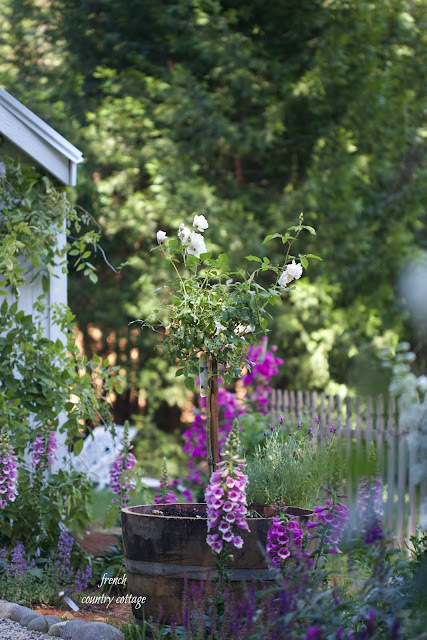 We eventually put a decorative fence around my hydrangeas and planted rosemary around the roses. I have used Liqiid Fence and switch off using I Must Garden. It has a nice minty smell. I have also used the pellets when I know I will be out of town and not risking possible rain washing away the spray. But in the end the only for sure thing that they will not eat is concrete! Great article, Courtney! I love your garden, the photos are beautiful! Like you, I am a huge fan of roses, but the red sort. The aroma and the beauty is something I cannot get enough of. That liquid fence idea sounds great and the plants look really beautiful. I would love to learn more about how you take care of them to get such incredible results. One of my favorite things to do, no matter where I am in the world, is to spend an afternoon in a garden, Your garden is very beautiful.